Type LE-3 instrument is designed to be used for measurements elementary value like votlage or current. LE-3 measures rms value. The LE-3P moving-iron instruments are designed for the measurement of alternating currents of frequencies ranking between 40 and 400Hz. The LE-3P measures rms value. The LM-3 moving-coil instruments are used for the measurement of direct current and d.c. voltages. Type LM-3 are offer as one or multi-ranges instruments. 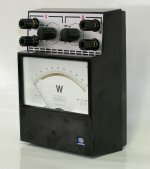 The LW-1 ferrodynamic wattmeter’s are designed for the measurement of power in DC and AC single-phase circuits at frequencies ranking between 15 and 200Hz and power in three-phase three-wire networks with artificial neutral point measuring system. 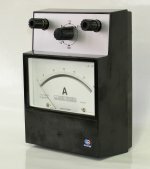 Type OD-41 accessory is a device that extend measuring ranges wattmeter LW-1.